BOAT OWNER'S NOTES for 2004 MONTEREY 322 Sport Cruiser in Very Good condition, call owner John @ 646-752-3737 or email: itsilker@aol.com. Boat is located in Miami, Florida. OVERVIEW: This 2004 MONTEREY 322 is one of MONTEREY's most desirable models, Interior and exterior of this boat are like brand new, Sleeps 5, Shower, Head equipped with vacu-flush, She is equipped with all the amenities including Wet Bar with 18 bottle Wine Cooler, Very high quality NEW Bimini Top replaced about 1 year ago, all seats are brand NEW which cost me $9,000 and still not used yet, Replaced carpet with teak wood, high quality and expensive material that doesn't require any maintenance, never gets stained and never gives off an offensive smell like carpets do, KOHLER generator with only 24 hours and just serviced, LED lights inside and at the bottom, This MONTEREY comes with too many options to list here. ENGINES: Twin VOLVO PENTA Duo Prop Drives with 320 hp each and having only 260 hours. REPLACED PARTS: Tail pumps, Synthetic oil, Oil filters, Distribution cap/Wires/Spark plugs, NEW AC Water pump, All NEW Batteries, starters, Belts and many more, I will show you the receipts. 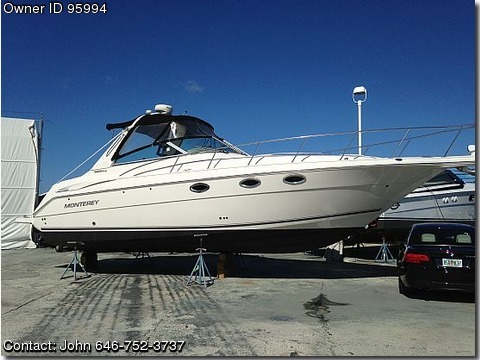 FINAL NOTES: This boat is ALWAYS kept on a lift and fresh water flushed after each use, You won't have to do any maintenance for many years to come, EVERYTHING WORKS, WILL CONSIDER TRADE BUT SERIOUS BUYERS ONLY PLEASE, call me (John) @ 646-752-3737.